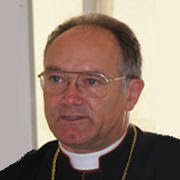 There has been widespread speculation, based on supposedly knowledgeable remarks by an Italian correspondent, Andrea Tornielli, that the delay in publication of the Apostolic Constitution regarding Personal Ordinariates for Anglicans entering into full communion with the Catholic Church, announced on October 20, 2009, by Cardinal William Levada, Prefect of the Congregation for the Doctrine of the Faith, is due to more than "technical" reasons. According to this speculation, there is a serious substantial issue at the basis of the delay, namely, disagreement about whether celibacy will be the norm for the future clergy of the Provision. "Had I been asked I would happily have clarified any doubt about my remarks at the press conference. There is no substance to such speculation. No one at the Vatican has mentioned any such issue to me. The delay is purely technical in the sense of ensuring consistency in canonical language and references. The translation issues are secondary; the decision not to delay publication in order to wait for the ‘official’ Latin text to be published in Acta Apostolicae Sedis was made some time ago. §1 Those who ministered as Anglican deacons, priests, or bishops, and who fulfill the requisites established by canon law and are not impeded by irregularities or other impediments may be accepted by the Ordinary as candidates for Holy Orders in the Catholic Church. 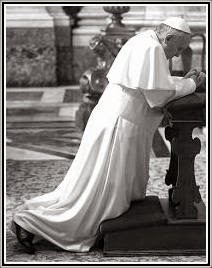 In the case of married ministers, the norms established in the Encyclical Letter of Pope Paul VI Sacerdotalis coelibatus, n. 42 and in the Statement "In June" are to be observed. Unmarried ministers must submit to the norm of clerical celibacy of CIC can. 277, §1. This article is to be understood as consistent with the current practice of the Church, in which married former Anglican ministers may be admitted to priestly ministry in the Catholic Church on a case by case basis. With regard to future seminarians, it was considered purely speculative whether there might be some cases in which a dispensation from the celibacy rule might be petitioned. For this reason, objective criteria about any such possibilities (e.g. married seminarians already in preparation) are to be developed jointly by the Personal Ordinariate and the Episcopal Conference, and submitted for approval of the Holy See." Father Leon Nowakowski graduated from the Theological Seminary in Wloclawek, and was ordained to the priesthood on June 20, 1937. He continued his theological studies in Lublin and at the Pontifical Gregorian University. At the outbreak of World War II, Father Nowakowski was spending his summer vacation in his native Byton, Poland. After the invading Germans arrested the local Parish Priest, Father Nowakowski took over his duties. On October 24, 1939, Nowakowski was arrested by the Gestapo on his way to a Rosary devotional exercise and was taken to Piotrkow Kujawski. 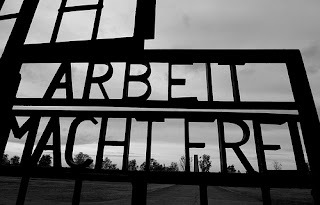 On the eve of All Saints, 1939, a Nazi platoon gathered all those imprisoned at Piotrkow Kujawski and had them shot. The bodies of the victims were buried in a mass grave outside the city. Father Nowakowski (1913-1939) was beatified by Pope John Paul II in 1999. Recess continues; relevant news may be posted at any time. In recent days there has been much talk about the "impending reunion" of the Orthodox with Rome (especially of the Bulgarians, who don't even want to continue the dialogue with Rome). While I am certain that all true Catholics desire to see the return of the Orthodox to unity with Rome -- a unity that above all should be a unity of faith -- I have to ask if people realize that such misleading reporting, far from hastening this reconciliation, is actually a major obstacle to true reunion. False reporting accomplishes nothing except to create the momentary illusion that doctrinal differences have been resolved or are of no real consequence (or are not really differences at all), and that false ecumenism works. In this situation, I suppose that a consolidation is needed in the efforts of those churches which consider themselves "Churches of Tradition," that is, the Orthodox, Catholics and pre-Chalcedonians. I am not talking about the serious dogmatic and ecclesiological differences which exist between these Churches and which can be considered within the framework of bilateral dialog. I am talking about the need to reach an agreement between these Churches on some strategic alliance, pact, union for defending traditional Christianity as such—defense from all modern challenges, whether militant liberalism, militant atheism or militant Islam. I would like to underline that a strategic alliance is my own idea, not the official position of the Moscow Patriarchate. We do not need union with the Catholics, we do not need "intercommunion," we do not need compromise for a doubtful "rapprochement." What we do need , in my opinion , is a strategic alliance , for the challenge is made to traditional Christianity as such. This is especially noticeable in Europe , where de-Christianization and liberalization are occurring as persistently as the gradual and unswerving Islamization. The liberal, weakened "Christianity" of the Protestant communities cannot resist the onslaught of Islam; only staunch, traditional Christianity can stand against it, ready to defend its moral positions. In this battle, the Orthodox and Catholics could, even in the face of all the differences accumulated over the centuries, form a united front. Continuing his address, His Beatitude said that the ecclesiastic dialogue should also include monks, who do not confuse «speculation with revelation»; they know that Christianity does not involve speculation. They know what the truth is: that a Christian's goal is deification. The representatives of the theological dialogue between the Churches and the leaders of the Churches should be pleased, if both levels of dialogue were to coexist; that is, love and truth. Not love alone. His Beatitude stressed that it is about time both Churches examined what divides them, and not what the elements that unite them are. The St. Lawrence Press Ordo Recitandi for 2010 is now available. For information on how to order, please click here. 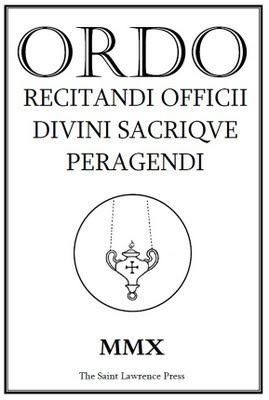 The revived traditional Ordo Recitandi was first published in England in1973 by the Saint Pius V Association and later by the SSPX. Since 1984 it has been published by the Saint Lawrence Press. The Ordo follows the Universal Calendar of the Roman rite and follows the liturgical books that were in use prior to Pius XII's reforms. The Ordo is entirely in Latin and modelled on Ordines from the middle of the last century. The Saint Lawrence Press believes that awareness should be raised of the extent of liturgical reform before the Second Vatican Council. A work, at long last, is now in preparation by the Saint Lawrence Press concerning Choral Celebration of the Office. 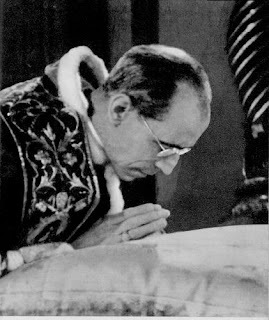 Until recent years, the topic of the liturgical reforms of Popes Pius XII and John XIII has remained in the background due to the more urgent task of keeping the Classical Roman Rite alive. Nevertheless the topic remains of live interest, and there is growing discussion in traditionalist Catholic circles -- and even among some scholars who are not “traditionalist” at all -- regarding the real extent and nature of the liturgical reforms that were carried out between 1945 and 1962. As is now well known, not a few of these reforms paved the way for the even greater liturgical innovations that have been enacted from 1964 to the present. This Ordo is recommended for those who want to the say the Office the way it would have been said prior to the reforms (mainly laymen, I would suppose); and also for those who, while considering themselves bound to follow the rubrics in effect in 1962, would like to have an easier but more comprehensive way of comparing the pre-Pius XII and Johannine Office and Missal books. There will be Solemn Pontifical Requiem Mass at the faldstool for All Souls' Day in New York City at the Church of the Holy Innocents (37th St. and Broadway) on Monday, November 2nd at 6:30 PM. The choir will sing Victoria's Requiem for six voices. After Mass, there will be the Rite of Absolution at the catafalque. This Mass will be the first Pontifical Requiem Mass in New York City since the Council. We all thought that maybe Cardinal Spellman's funeral might have been the last. But, interestingly, Cardinal Spellman's 1967 funeral was already entirely in English, the con-celebrants wore purple and the Dies Iræ Sequence was omitted. 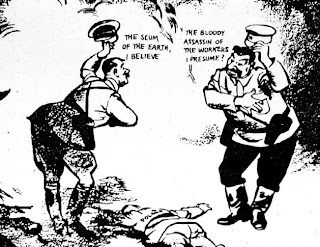 It provoked some controversy at the time. Tapers will be distributed during the Mass to those in the Sanctuary as well as to the congregation. The Pontifical Mass will be offered by Bishop James C. Timlin, Bishop Emeritus of Scranton. eo usque dum tandem aliquando una sempiternaque in caelis beatitate fruamur. -How to recover the sense of liturgy? "It went fine, the difficulties exist - one of those present tells Il Giornale - but the beginning was good." A few days before the meeting, the Lefebvrists had received from the Vatican a kind of preparatory text with the arguments that would be discussed. The debate that began yesterday witnesses the Fraternity maintain that some of the Conciliar texts are not compatible with tradition, while the experts of the Holy See affirm the opposite. "How long the talks will take cannot be foreseen - the Vatican source continues -[;] we have decided to set a bimonthly frequency, we will thus meet again right after Christmas. But in the meantime work will be done, and diligently, using e-mail to exchange considerations, questions, in order to arrive at the next meeting, as far as possible, with some point of agreement." Journalists have often asked: what would be the preferred format for the Fraternity, an Apostolic Administration, such as Campos, a Personal Prelature, as Opus Dei, or a Personal Ordinariate, as the one granted to the Anglicans? [Fellay:] The Vatican has already declared very clearly that no canonical statute will be given to the Fraternity before the end of the doctrinal dialogues. As there is nothing official, and nothing known, I cannot say anything. The only thing I can say is that Rome wants to establish for us something that is convenient for the Fraternity. It has been said that the Holy See might publicly recognize faculties for all Sacraments celebrated by the Fraternity. Do you believe that this might take place shortly? [Fellay:] I have no idea. I simply do not know. And the last question is: will the Fraternity accept, temporarily, a provisional canonical structure during the doctrinal discussions? [Fellay:] This idea does exist, but it is a problem inside the Church. There are many, many bishops who truly hate us. Actual enemies of the Fraternity. And they would do all within their power to destroy us. This provisional arrangement would not solve the problem of the priests and of the faithful. The bishops would place great obstacles and chaos would set in. Therefore, a canonical solution will have to be permanent. Some small steps could be taken, for instance, recognizing the Sacraments celebrated by the Fraternity and such. We thank contributor Al Trovato and reader P.K.T.Perkins for sending us these questions and also those in Brazil who had asked us for questions and to whom we forwarded these, among others; and also the interviewer (Juliana Fragetti) who managed to get these interesting answers from Bishop Fellay in that conference. COMMUNIQUÉ OF THE PONTIFICAL COMMISSION "ECCLESIA DEI"
On Monday 26 October 2009 in the Palazzo del Sant'Uffizio, headquarters of the Congregation for the Doctrine of the Faith and of the Pontifical Commission "Ecclesia Dei", the study commission made up of experts from "Ecclesia Dei" and from the Society of St. Pius X held its first meeting, with the aim of examining the doctrinal differences still outstanding between the Society and the Apostolic See. In a cordial, respectful and constructive climate, the main doctrinal questions were identified. These will be studied in the course of discussions to be held over coming months, probably twice a every other month [Edited by the Holy See Press Office]. In particular, the questions due to be examined concern the concept of Tradition, the Missal of Paul VI, the interpretation of Vatican Council II in continuity with Catholic doctrinal Tradition, the themes of the unity of the Church and the Catholic principles of ecumenism, the relationship between Christianity and non-Christian religions, and religious freedom. The meeting also served to specify the method and organisation of the work. For the doctrinal talks between the representatives of the Holy See and those of the Priestly Fraternity of Saint Pius X (FSSPX / SSPX). The first day of the discussions is this Monday. We present here the first photos of the Pontifical Mass offered Sunday by His Excellency Bishop Bernard Tissier de Mallerais in the Basilica of St. Pius X at Lourdes in front of 10,000 priests, religious, and faithful. Bishop Tissier de Mallerais listens to the chanting of the gospel from the throne at the Basilica of St. Pius X in Lourdes. He is surrounded by the Reverend Jean-Jacques Marziac, assistant to the throne, and Father Louis-Marie Turpault, grand master of ceremonies. Exiting the Sacristy, Bishop Tissier de Mallerais passes before several members of the Italian episcopate. He is preceded by Father Regis de Cacqueray, assistant priest, and Father Jacques Laguérie, deacon. 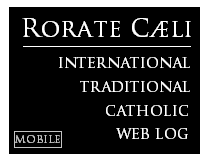 1970 was the first full liturgical year of the New Roman Rite (the "Ordinary Form" of the Roman Rite), a bitter year for all Catholics who love and cherish the Tradition and traditions of their Church. Amidst the ruins of the post-Conciliar years, the event of October 25, 1970, was a glorious exception: the canonization of the 40 Martyrs of England and Wales. 40 Catholic men and women, priests, religious, and lay faithful, who represented hundreds more killed in England and Wales since the tragic events of the 16th century simply because they were Catholics and faithful to the Tradition and traditions that they had received. May the blood of these Martyrs be able to heal the great wound inflicted upon God’s Church by reason of the separation of the Anglican Church from the Catholic Church. Is it not one - these Martyrs say to us - the Church founded by Christ? Is not this their witness? Their devotion to their nation gives us the assurance that on the day when-God willing-the unity of the faith and of Christian life is restored, no offence will be inflicted on the honour and sovereignty of a great country such as England. 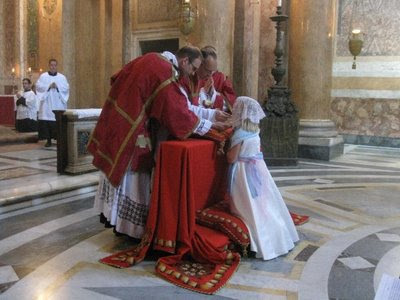 There will be no seeking to lessen the legitimate prestige and the worthy patrimony of piety and usage proper to the Anglican Church when the Roman Catholic Church - this humble “Servant of the Servants of God” - is able to embrace her ever beloved Sister in the one authentic communion of the family of Christ: a communion of origin and of faith, a communion of priesthood and of rule, a communion of the Saints in the freedom and love of the Spirit of Jesus. Perhaps We shall have to go on, waiting and watching in prayer, in order to deserve that blessed day. But already We are strengthened in this hope by the heavenly friendship of the Forty Martyrs of England and Wales who are canonized today. Amen. "That blessed day" are the historic days we live today: in the time and manner set by the Almighty, the reunion of all serious-minded Anglicans with the Church will take place. It is certainly not the way many thought reunion would take place in those hectic post-Conciliar years... But it will take place. Thank you, Holy Martyrs of England and Wales. 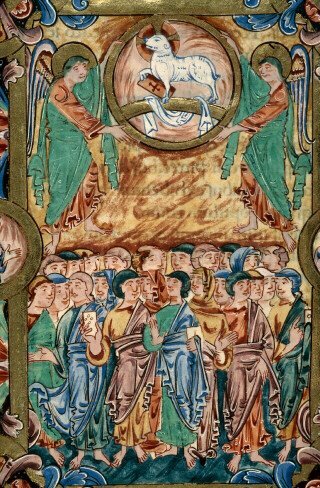 Dixit Pilatus ad Iesum: "Tu es rex Iudæorum?" Respondit Iesus: "A temetipso hoc dicis, an alii dixerunt tibi de me?" Respondit Pilatus: "Numquid ego Iudæus sum? Gens tua et pontifices tradiderunt te mihi: quid fecisti?" Respondit Iesus: "Regnum meum non est de hoc mundo. Si ex hoc mundo esset regnum meum, ministri mei utique decertarent ut non traderer Iudæis: nunc autem regnum meum non est hinc." Hear then, ye Jews and Gentiles! Hear, O circumcision! Hear, O uncircumcision! Hear, all ye kingdoms of the earth: I interfere not with your government in this world, "My kingdom is not of this world." Cherish ye not the utterly vain terror that threw Herod the Elder into consternation when the birth of Christ was announced, and led him to the murder of so many infants in the hope of including Christ in the fatal number, made more cruel by his fear than by his anger: "My kingdom," He said, "is not of this world." What would you more? Come to the kingdom that is not of this world! Come, believing, and fall not into the madness of anger through fear! He says, indeed, prophetically, of God the Father, "Yet have I been appointed king by Him upon His holy hill of Zion;" but that hill of Zion is not of this world. For what is His kingdom, save those who believe in Him, to whom He says, "Ye are not of the world, even as I am not of the world"? And yet He wished them to be in the world: on that very account saying of them to the Father, "I pray not that Thou shouldest take them out of the world, but that Thou shouldest keep them from the evil." Hence also He says not here, "My kingdom is not" in this world; but, "is not of this world." And when He proved this by saying, "If my kingdom were of this world, then would my servants fight, that I should not be delivered to the Jews," He saith not, "But now is my kingdom not" here, but, "is not from hence." But still it is not from hence; for it only sojourns as a stranger in the world: because He says to His kingdom, "Ye are not of the world, but I have chosen you out of the world." They were therefore of the world, so long as they were not His kingdom, but belonged to the prince of this world. Of the world therefore are all mankind, created indeed by the true God, but generated from Adam as a vitiated and condemned stock; and there are made into a kingdom no longer of the world, all from thence that have been regenerated in Christ. For so did God rescue us from the power of darkness, and translate us into the kingdom of the Son of His love: and of this kingdom it is that He saith, "My kingdom is not of this world;" or, "My kingdom is not from hence." Inquirer: Have decisions been made yet about the liturgy you'll use? JH: An international group is working at the moment on the liturgical books for the new Anglican structure. I anticipate something that combines glimpses of pre-Reformation English worship, the glorious liturgical language of the Reformation period and contemporary understanding of the way Christians should approach God will eventually be approved. Inquirer: How do the Pope's proposals mesh the Latin celibate discipline for all clergy with Anglicanism's longstanding acceptance of married priests and bishops? JH: Bishops in the new Anglican structure will be unmarried. This is out of respect for the tradition of Eastern and Western Christianity. But priests who come from Anglicanism will be able to serve as priests in the new structure, whether married or not, after satisfying certain requirements. The truly radical element is that married men will be able to be ordained priests in the Anglican structure indefinitely into the future. It is anticipated that Anglican bishops who are married when they joined the new structure will still be able to serve as priestly ordinaries, exercising some of the responsibilities of bishops. Inquirer: How will the Orthodox react to the new arrangements? Will they be viewing the next six months as a test of Rome's ecumenical bona fides? JH: Already there are stories circulating that the Patriarch of Moscow has urged his ecumenical negotiators in the Vatican to hurry in order that the Anglicans do not get too far ahead. They're probably apocryphal, but we do know that the Russian Orthodox Church is very close to achieving unity with Rome. It is the largest of the Orthodox churches of the East. We also know that the Orthodox are watching the Anglican process very closely to try to assess the extent to which Rome is serious about tolerating many different traditions of Christianity within the scope of the Catholic Church. I have had conversations with members of the Greek Orthodox Church and the Coptic Church about the parallels between their conversations with Rome and ours. Christian unity throughout the world is at a very similar moment. Conversation and co-operation are beginning to evolve into forms of organic unity that still protect diverse Christian traditions of worship and spirituality. The leading "Anglican Catholic" group in the United Kindgom, Forward in Faith, conveniently celebrates its annual conference this Friday and Saturday - conveniently for all of us who want to understand what Anglo-Catholics want after this week's momentous news. You may listen online to the various interventions in the website of FiFUK. Tip: Sub Tuum (cf. our blog roll). (UPDATE) Listening to the speeches with an open heart, one feels shocked and appalled by most of the speakers (not all of them, but most). For any convert to Catholicism, it is truly painful to listen to words such as those of a certain "Father" Alan Rabjohns, of "The Church in Wales", who declared, "I will not become a Roman Catholic unless I am forced to become a Roman Catholic." On June 7, 2009 I resigned as a priest in the Church of England. On July 18, 2009 I was received into full communion in the Catholic Church. I have been asked numerous times if I am sorry that I left when I did as a result of the news this week from the Vatican on what Pope Benedict XVI is graciously offering Anglicans. The answer is a theological profound no way. I am a Catholic now and I have never been more happy about my personal decision to depart when I did. I could do no other as it was an issue that impacted the salvation of my soul as one who was theologically convinced of Catholic theology and what it meant to be a Catholic in communio with the Holy Father and the universal Catholic Church. This decision was all the more confirmed after listening to my former affiliation FiF UK's discussion at their general meeting tonight. I was at the meeting this past February and it was at that meeting where I decided that what I understood to be Catholic was not what I was hearing from many. This present meeting is even more clear than the one in February that all the talk of being Catholic 'seems' to be not much more than what the individual wants to believe is Catholic. To be perfectly honest, it almost feels like a bluff has been called. Sitting and listening to those speeches made me sad and realise that for many in the C of E, the issue that alone makes them 'feel' Catholic is being against the ordination of women or so it seems. Let me state clearly that I did not leave the C of E over women's ordination or homosexuality though in regards to both of these issues I hold the Catholic orthodox line. I became Catholic because being Catholic was true, the primacy of Peter and his infallibility is true and the lack of the Magisterium in Anglicanism leaves the priest with nothing other than his (or now her) own opinion. I am afraid that this sort of approach has nothing to do with true Catholicism. This approach has nothing to do with the theological idea of communio in the writings of the Holy Father either. ... I am finding the addresses to be very difficult to listen to. I honestly wonder how it is that I belonged to a movement that gives appearances of not really wanting real reunion with Rome when it has finally been offered with some real substance. What I hope becomes clear to those at this Assembly is that the Holy Father is NOT putting forth some document to be revised by a revision committee or determined by a popularity of a majority as something akin to a general synod. Sorry folks, that is not the Catholic way. It's not about lace and birettas; it's about authority and truth. There is all sorts of talk about Eucharist and ecclesiology and an ecclesial solution to their problems but this language is becoming all the more nothing save fancy rhetoric. It is really time to take a closer look at what is the substance of being Catholic. I was absolutely shocked and grateful for the generosity and love our Holy Father is offering the Anglican worldwide communion and then only to hear the voices of people claiming to be Catholic at this meeting and longing to remain Anglicans and CofE blows the mind. .... I am afraid that what has not yet really happened to many is a true conversion to a Catholic way. I mean that in the best sense of the definition of Catholic. Because it is a real conversion of heart to make one give up everything and follow Jesus' call to unity. Sacrifice is involved and one has to be willing to sacrifice all if we are to have the substance of the Christian life. There is nothing to be salvaged in my opinion about Anglicanism as an 'ism'. The Reformation is one of the greatest tragedies in ecclesial history. Why the assembly is not falling down on its knees and thanking God for answering their prayers in this Newman moment is really mind-boggling. Many might ask me why I care. The answer is, because our Holy Father and pastor just extended a hand of welcome for reunion and reconciliation beyond what any could imagine and they have to think about it...I hope the Vatican isn't listening to that assembly. What I feel is most problematic is that so many claim to have been praying for the very thing that the Holy Father has given and even more and now what is in reality a lovely piece of fish seems to be treated as if it were only a stone. Sadly, this all seems a bit ungrateful to me. Jeffrey Steel is right: there has been no true conversion to the Catholic way for most of those gathered there. Until those people understand, in their hearts and minds, what it means to be a Catholic, they should please remain where they are; it is not as if they are prodigal sons, but reckless stepchildren who refuse to embrace a Father who extends his open arms, or who will only do so, reluctantly and half-heartedly, if urgent circumstances force them to act. Draw not nigh hither: Rome is holy ground! Present norms of incardination and excardination should be so revised that, while this ancient institution still remains intact, they will better correspond to today's pastoral needs. Where a real apostolic spirit requires it, not only should a better distribution of priests be brought about but there should also be favored such particular pastoral works as are necessary in any region or nation anywhere on earth. by means of which, according to their particular statutes and always saving the right of bishops, priests may be trained and incardinated for the good of the whole Church. Monsignor, a widespread restrictive interpretation of the motu proprio argues that the Papal provision is primarily if not exclusively, directed towards those groups and institutes that were already attached to the traditional form, and is not, by contrast, intended in any way to promote the extraordinary form. To this had already answered Card. 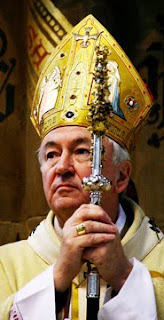 Castrillón Hoyos, saying in London, in June 2008, that the Pope would actually like to have the 'Gregorian Rite' in all the parishes. What is your opinion? The Motu Proprio is addressed to all the Catholic faithful who desire the extraordinary form of the Roman liturgy, not just to those who, prior to its promulgation, were attached to the ancient form of the Roman rite. Certainly it does intend to accomodate these latter and to heal old wounds, but the purpose of the document is also to allow the spreading of the extraordinary form, for the benefit of those who do not know it yet (for being too young to have had it experienced), or of those who rediscover with joy the Mass of their youth. The ever increasing spread of this liturgical treasure, the Church's patrimony, can bring many benefits, spiritual and vocational, also through the mutual enrichment between the two forms of the Roman rite. The Pope's letter accompanying the motu proprio refers to a term of three years, after which reports of the bishops will be collected to assess the situation. That may mean, as some argue, that the liberalization of the old Missal stipulated by the motu proprio is to be understood ad experimentum, or at least that at the end of this evaluation there may be restrictions regarding the the extraordinary form, such as for instance the return to a regime similar to that of the indults of 1984 or 1988? The three-year term simply refers to a balance of the first three years of application. If there turn out to be serious difficulties, appropriate remedies will be found, always keeping in mind the essential purpose of the motu proprio. From many parts obstacles opposed to the implementation of the motu proprio have been reported. We, too, have experienced them... What should an adequate group of lay people who find themselves in such situations of difficulty do to obtain a weekly Mass in the extraordinary form? And in what way can the Commission Ecclesia Dei intervene? The answer is already written in the motu proprio: ask the parish priest and possibly look for a priest ready. Should this prove impossible, it is necessary to turn to your bishop, who is called to seek an appropriate solution. If even this way no satisfaction of the request is obtained, write to the Commission Ecclesia Dei, which, however, deals with the bishops, who are naturally our interlocutor: they are asked for an assessment of the situation, to see what the actual difficulties are and how to find a remedy. ... Changing the subject, have you seen the results of the Doxa survey commissioned by Paix liturgique and us? Yes, I was given a preview a few days ago. These figures are truly remarkable and encouraging, especially that absolute majority of practicing Catholics who, at least according to the poll, regard the coexistence of the two forms of the Mass in the parishes as perfectly normal. I understand that a copy of the survey has also reached the Holy Father. Thanks again Monsignor, and keep up the good work. The Church hails with joy and follows with her maternal blessing every method of guidance and care which aims at a wise and orderly evolution of particular forces and tendencies having their origin in the individual character of each race, provided that they are not opposed to the duties incumbent on men from their unity of origin and common destiny. She has repeatedly shown in her missionary enterprises that such a principle of action is the guiding star of her universal apostolate. 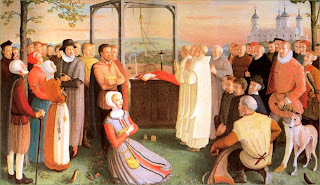 Pioneer research and investigation, involving sacrifice, devotedness and love on the part of her missionaries of every age, have been undertaken in order to facilitate the deeper appreciative insight into the most varied civilizations and to put their spiritual values to account for a living and vital preaching of the Gospel of Christ. All that in such usages and customs is not inseparably bound up with religious errors will always be subject to kindly consideration and, when it is found possible, will be sponsored and developed. Our immediate predecessor, of holy and venerated memory, applying such norms to a particularly delicate question, took some generous decisions which are a monument to his insight and to the intensity of his apostolic spirit. Nor need We tell you, Venerable Brethren, that We intend to proceed without hesitation along this way. Those who enter the Church, whatever be their origin or their speech, must know that they have equal rights as children in the House of the Lord, where the law of Christ and the peace of Christ prevail. In accordance with these principles of equality, the Church devotes her care to forming cultured native clergy and gradually increasing the number of native Bishops. And in order to give external expression to these, Our intentions, We have chosen the forthcoming Feast of Christ the King to raise to the Episcopal dignity at the Tomb of the Apostles twelve representatives of widely different peoples and races. In the midst of the disruptive contrasts which divide the human family, may this solemn act proclaim to all Our sons, scattered over the world, that the spirit, the teaching and the work of the Church can never be other than that which the Apostle of the Gentiles preached: "putting on the new, (man) him who is renewed unto knowledge, according to the image of him that created him. Where there is neither Gentile nor Jew, circumcision nor uncircumcision, barbarian nor Scythian, bond nor free. But Christ is all and in all" (Colossians iii. 10, 11). Nor is there any fear lest the consciousness of universal brotherhood aroused by the teaching of Christianity, and the spirit which it inspires, be in contrast with love of traditions or the glories of one's fatherland, or impede the progress of prosperity or legitimate interests. For that same Christianity teaches that in the exercise of charity we must follow a God-given order, yielding the place of honor in our affections and good works to those who are bound to us by special ties. Nay, the Divine Master Himself gave an example of this preference for His Own country and fatherland, as He wept over the coming destruction of the Holy City. But legitimate and well-ordered love of our native country should not make us close our eyes to the all-embracing nature of Christian Charity, which calls for consideration of others and of their interests in the pacifying light of love. ...[T]here is yet another error no less pernicious to the well-being of the nations and to the prosperity of that great human society which gathers together and embraces within its confines all races. It is the error contained in those ideas which do not hesitate to divorce civil authority from every kind of dependence upon the Supreme Being - First Source and absolute Master of man and of society - and from every restraint of a Higher Law derived from God as from its First Source. Thus they accord the civil authority an unrestricted field of action that is at the mercy of the changeful tide of human will, or of the dictates of casual historical claims, and of the interests of a few. Once the authority of God and the sway of His law are denied in this way, the civil authority as an inevitable result tends to attribute to itself that absolute autonomy which belongs exclusively to the Supreme Maker. It puts itself in the place of the Almighty and elevates the State or group into the last end of life, the supreme criterion of the moral and juridical order, and therefore forbids every appeal to the principles of natural reason and of the Christian conscience. As it is widely known, relevant pontifical documents are usually identified by their incipit, the first word or words of the original document. The title of a document may be random (that is, with no specific relation to the content of the text - they are just the first words that remained in the beginning of the text), but the identifying words are usually placed on purpose in their prominent position. Since we do not yet have the title of the upcoming Apostolic Constitution on the Personal Ordinariates for the reception of Anglicans and their communities, it could be interesting to play with this - and it is quite possible that the communities will be identified by the name of the Constitution itself. Please, enter your suggestion (in Latin or in English) as a comment. This is also an open thread for any Anglican-Catholic matter. The enthusiastic response to the Rosary Crusade we encounter throughout the world fills us with consolation and prompts us to take up this theme once again with you. If we are petitioning Heaven with this multitude of Aves, it is because the hour is indeed grave. We are sure of Our Lady’s victory because she herself foretold it, but the events that have been unfolding for nearly a century—since this triumph was announced at Fatima—oblige us to suppose that all kinds of other woes could yet befall mankind before this victory. Yet the rules given at Fatima by the Mother of God were quite simple: if the world does not convert, it will be punished: “There will be a second war, more terrible than the first.” The world did not convert. And God’s answer was not long in coming. Since the Second World War, the world still has not converted. And if people think Russia has converted, they will have to explain to us in what it has converted, and to whom— economic liberalism? Almost one hundred years later, we observe that the world has surely not become better; quite the contrary. The war of the unbelievers rages harder than ever, but it has taken an unexpected turn: the demolition of the Church is being carried out especially by subversion, by infiltrating the Church. Our holy Mother the Church is in the process of being transformed into a pile of spiritual ruins while the exterior façade remains more or less intact, thus deceiving the multitude about its real condition. And it has to be admitted that this subversion acquired an unexpected increase of efficacy on the occasion of the Second Vatican Council. It doesn’t take an advanced degree in theology to figure this out; today it is an historical fact. What part of the responsibility should be attributed to the Council itself? This is a difficult question, but it is clear that this Council was not without effect, and its consequences have been well and truly disastrous. Because of it, the Church fell in step with the world. “We, too, in fact, we more than any others, honor mankind,” said Paul VI at the Council’s conclusion. And the man-centered orientation of Vatican II was harped on by John Paul II. But this orientation is indeed odd for the Church of God, supernatural in its essence, having received from Our Lord Jesus Christ not only its constitution and means, but first and foremost its end, which is nothing else than the continuation of His own redemptive and salvific mission: “Go into the whole world and preach the gospel to every creature. He who believes and is baptized shall be saved, but he who does not believe shall be condemned.” (Mk. 16:15-16). And now, here is the tragedy: the divine mission of the Church has been replaced by a purely human one. It is a great mystery that leaves one astounded. Salvation now comes second, to say the least. Few men—very few men, unfortunately—understand that the terrible crisis of the Church since the Second Vatican Council is a chastisement more terrible than any other, for this time the catastrophe is spiritual: what is wounded, what is noiselessly killed in the midst of an indifference worse than death, are souls. The loss of grace in a soul is the most terrible harm that can happen to it because it makes no noise, it is not felt. And the voice of the watchmen has fallen silent. The call to conversion, to penance, to the flight from sin, temptations and the world has given way, if not to indulgence, then at least to sympathy with the world. There is a real will to make peace with the modern world. The mission of salvation has given way to a new sort of humanitarian mission; it is a matter of helping men of every condition and religion to live well together on earth. There is no doubt that everything connected in the message of the Blessed Virgin of Fatima, what is referred to as the Secret of Fatima, has not yet come to an end. Certainly, what we are living is per force part and parcel of the events that will end one day, eventually, with the triumph of Mary. What will happen? How will we recognize it? In any case, it will at least entail the conversion of Russia according to the very words of the Blessed Virgin Mary. This mortal hatred of the Church, of Christ, and of His Vicar on earth is not just an outburst of misguided individuals, but rather a systematic action that proceeds from the principle of Freemasonry: the destruction of all religion, but especially the Catholic religion. [Pisma Ojca Maksymiliana Marii Kolbego franciszkanina, Niepokalanow, maszynopsis, 1970; English tr. from The Immaculata Our Ideal, by Fr. Karl Stehlin (Warsaw, 2005), p. 39]…. all lawful means, getting the word out everywhere by the diffusion of the Marian press and the Miraculous Medal, and enhancing our action by prayer and good example. [Testimony of Fr. Pignalberi reported during the process of canonization]. He founded the Militia of the Immaculata just a few days after the October 13th apparition of Our Lady at Fatima, when the great miracle of the sun took place. It was in fact on October 16, with six fellow seminarians, that he consecrated himself to the Immaculate Heart of Mary for the purpose of leading the whole world to God by the Immaculata. Very dear faithful, it is in this same spirit that we launched the Rosary Crusade. But prayer is only a part of it: let us not forget the other two very important elements, penance and devotion to the Immaculate Heart of Mary. By mortification, we wish to make reparation for the insults given to Mary, and in union with her sorrowful Heart we wish to associate ourselves as closely as possible to the sacrifice of the Cross of our Lord, because by it our salvation is effected. Thus we are at the heart of the message of Fatima: “God wishes to introduce devotion to my Immaculate Heart.” Perhaps not enough emphasis is given to this aspect, which seems to us even more important than the consecration of Russia and which is the second condition indicated by Mary to the pope for her triumph: consecrate Russia and promote devotion to her Immaculate Heart. In this month of October we are going to enter into a new phase in our relations with the Vatican, that of the doctrinal discussions. What is at stake is very important, and we recommend them to your prayers. Undoubtedly that also is a part of our Crusade, and obviously this intention is included in the triumph of the Immaculate Heart of Mary we all desire. That also completely outstrips all our own powers, and it would be folly pure and simple to undertake such an enterprise were it not sustained by the power of the supernatural means such as prayer and penance. We do not want to conclude this letter without also thanking you for your generosity, which enables our work to develop throughout the world. There is one thing, though, that slows us down: the harvest is abundant, but workers for the harvest are lacking. Our Lord has already said it and has shown the remedy: pray for vocations! How we should like to come to the aid of all the faithful who only have the Mass once a month, or only on Sundays, unable to benefit from normal pastoral care… Yet the good Lord has gratified us this year with 27 new priests, and we expect an even slightly larger number next year. But even that is not enough, so great is the demand worldwide. You are deeply thanked for all your efforts. May God reward you with the abundant graces and blessings we implore on you all, your families, your children. May Our Lady of the Rosary, the Immaculate Heart of Mary, protect you. On the Feast of the Maternity of the Blessed Virgin Mary, October 11, 2009. The announcement of this Apostolic Constitution has come as a surprise. So, too, has the generosity of its measures. It is important to understand its context as well as its content. The Apostolic Constitution is the response of Pope Benedict to the approaches which have been made to the Holy See by groups of Anglicans, in different parts of the world, asking for full visible communion within the Catholic Church. It is, then, a response, not an initiative, by the Holy See. It is a response designed to establish a provision which will be equitable and uniform in whatever part of the world it may be taken up. It has a particular purpose: to permit those who wish to live their faith in full visible union with the See of Peter to do so while also preserving elements of the distinctive Anglican spiritual and liturgical patrimony. So this is a response to those who have declared that they share the common Catholic faith and accept the Pope's ministry as something Christ willed for the Church. In the words of Cardinal Levada: "For them, the time has come to express this implicit unity in the visible form of full communion." As Archbishop Rowan Williams and I said in our joint statement: "The announcement of this Apostolic Constitution brings to an end a period of uncertainty for such groups who have nurtured hopes of new ways of embracing unity with the Catholic Church." Much work now opens up, not only for those who hold such faith and will have to consider carefully the formal response of the Holy See, but also for the Catholic community. In approaching this work, some important perspectives have to be kept in mind. First, this response does not alter our determined and continuing dedication to the pathway of mutual commitment and cooperation between the Church of England and the Catholic Church in this country. The foundations of all the joint work in ARCIC and the International Anglican Roman Catholic Commission for Unity and Mission make clear the path we follow together. An Anglo-Catholic tradition will continue to be a part of the Church of England, nurtured by those who cherish this tradition while not ready to accept the current jurisdiction of the Holy See. We also need to appreciate what this moment makes clear about the mind of Pope Benedict XVI. I believe this is another illustration of his desire to achieve reconciliation with those who are estranged from the Catholic Church and who show a willingness to be reconciled. This desire is clearly one of the priorities of his pontificate. As he has written: "In our days, when in vast areas of the world the faith is in danger of dying out like a flame which no longer has fuel, the overriding priority is to make God present in this world and to show men and women the way to God. Not just any god, but the God who spoke on Sinai; to that God whose face we recognise in a love, which presses 'to the end' (cf John 13.1) - in Jesus Christ, crucified and risen ... So if the arduous task of working for faith, hope and love in the world is presently (and in various ways, always) the Church's real priority, then part of this is also made up of acts of reconciliation, small and not so small." (Letter to Bishops, March 10 2009). Reconciliation, then, is a part of the proclamation of the Gospel. Pope Benedict, we have to remember, is also ready to allow the breadth of the expressions of Catholic life to find their place in the Church. In that same letter he wrote: "But should not the great Church also allow herself to be generous in the knowledge of her great breadth, in the knowledge of the promise made to her? Should not we, as good educators, also be capable of overlooking various faults and making every effort to open up broader vistas?" The Holy Father clearly believes that legitimate diversity does not threaten the unity of the Church, a unity which is essentially of faith, expressed in visible communion and in the witness of life lived in conformity to the call of the Gospel. While this Apostolic Constitution establishes a single framework for the universal Church, clearly much detail will have to be established locally. Alongside the Constitution there will have to be agreements about the way forward and the practical steps by which Personal Ordinariates, if and when they are established, will be an integral part of the Catholic community, working in close unity with the dioceses of England and Wales. These matters are now to be considered both locally and in close consultation with the Holy See. This is an extraordinary moment. It is a challenge and an opportunity on many fronts. I salute the courage and generosity of Pope Benedict who has again shown an open and loving heart, just as one would expect of a Holy Father.